Precisely machined from a solid block of 6061-T6 aluminum, the Really Right Stuff LCF-54 Foot will replace the original foot of a Canon EF 100-400mm f/4.5-5.6L IS II USM lens and provides an extremely durable and stable platform for your lens. The foot incorporates an Arca-type compatible dovetail that has an increased height, which will make the grip more comfortable during transport. The bottom of the foot features both 1/4"-20 and 3/8"-16 accessory threads including a QD socket, which is compatible with a QD Strap Swivel, to connect a camera strap. At the same time, an integrated strap lug is available at the front. The foot comes with two safety-stop screws to prevent the foot from accidentally sliding out of some clamps and it is made in the USA. Box Dimensions (LxWxH) 5.9 x 2.4 x 0.1"
LCF-54 Foot for Canon 100-400mm f/4.5-5.6L IS II USM Lens is rated 4.9 out of 5 by 27. Rated 5 out of 5 by Randy from My Favorite Foot Compared to the original Canon or Kirk replacement feet, the RRS LCF-54 is my favorite. The RRS foot is taller which makes it easier to fit my hand in between the lens and the foot when using the foot as a handle. 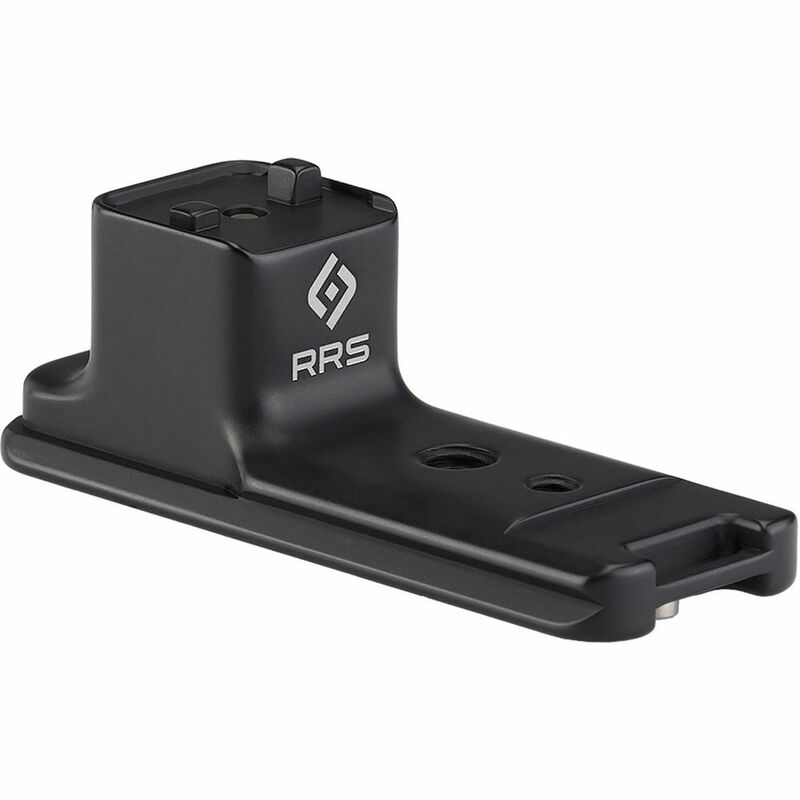 The RRS foot also has a more substantial feel being constructed from a solid block. The Kirk foot is a bit lighter and has a second dovetail for mounting a flash bracket or their LS-1 lens support. The Kirk is also an excellent choice and is less expensive than the RRS foot. Still, I found I prefer the feel of the RRS foot and the way it fits my hand when using it as a handle for the lens. Rated 5 out of 5 by John from Perfect match The RRS foot is a perfect match to the lens and provides a solid comfortable handle for carrying the lens. The tripod mount works well with my Vanguard Arca-Swiss compatible ball head. The foot has a place to attach a strap as well as 3/8 and 1/4 threaded mounts and removable safety stops for quick release heads. A wrench (supplied) is required to remove the foot but I will rarely be removing it so this is not a problem for me. The lens with foot still fits in the Canon lens case. Rated 5 out of 5 by Peter from The perfect solution for this lens What a difference this makes! I have been using the Canon feet with Kimberly plates (P20 and P30) on a 70-200 F2.8L IS and a 100-400 f4.5-5.6L IS and just upgraded the 100-400 to the Mark II, treating myself to this RRS foot. The RRS foot is light-weight, extends backward so I can balance the setup with a 1.4x Teleconverter and a battery grip on my 5DSr, while having the extra range on the long end. No issues with rotating plates (the Kimberly plate didnt work that well with the new Canon foot), more space for sliding finger between lens and this foot, and it will still all fit into the Canon lens pouch. Some reviewers criticize that the RRS foot cannot be removed without a tool and, yes, it would be nice. However, the extra space between the lens barrel and the foot offsets that for me: I simply rotate the foot to the top if I want to rest the lens on my hand instead of using a tripod. Canons own solution gets in the way when used that way. Highly recommended! Rated 5 out of 5 by Larry from Good Fit Feel this is better option that adding a plate to Canon Lens foot. Keeps height down and to plate to loosen. To bad for $2,000 Canon doesn't provide the lens foot with a Acra Swiss mount. Rated 5 out of 5 by steve from The foot Canon should have included This foot is perfect. it fits in the lens bag better then the stock foot with a Arca-Swiss plate bolted on. It is far more secure feeling then the plate setup as well. And if you have large hands it will be much easier to carry by the foot for you. Installation is very easy. I tell the chances of dropping my lens have gone down greatly now. Rated 4 out of 5 by Chad from RRS does it again: Simplifying Solutions The Canon foot which comes with the lens needs a plate. So I figured why buy a plate when for a few dollars more a foot/plate would serve me more simply. The only complaint I have is what is not present on the LCF-54, namely a simple way to remove the foot/plate from the collar. Canon's original foot provided such an attachment in the form an integrated screw, which really was clever. Otherwise the LCF-54 is a quality product in line with what Really Right Stuff is all about. Rated 5 out of 5 by greg k. from Greatest! REALLY RIGHT STUFF LCF-54 Lens Foot The RRS LCF-54 lens foot is a very well made item. It is much easier to use than the screw mount on the tripod head. All you have to do is slide the foot onto an ARCA-SWISS type plate and tighten the clamp. This is a real time saver whenever you need to use a tripod. I like it. Rated 5 out of 5 by joep from Perfect I do not find RRS replacement feet or L brackets always the best solution but this foot is perfect as well on tripod as in your hands. It feels good in your hands and there is space enough for your hand. I like it very much. Does this also fit the older 100-400 mm push/pull canon lens? No. It only fits the new mark II version. Does this fit the 400 Prime lens? I don't think so. Check with B&amp;H or RRS. Does this fit the 400mm prime lens? I suggest going to the Really Right Website and asking them. They are quick to respond. Really Right Stuff LCF-54 Foot for Canon 100-400mm f/4.5-5.6L IS II USM Lens - This product has been modified with a newer version by RRS by adding an Integrated QD socket. Does B&amp;H have the stock of new version? I bought one from B &amp; H in January 2018 and it was the new version. Is the QD socket on the LCF-54 that you are currently shipping? Why is this foot better than the one that comes with the lens? This foot allows a lower profile and the dovetail allows use with Quick release clamps. The rubber on the original foot provides grip (this LCF-17 is slippery) and I find more comfortable. I use it on my 400mm FL but not on my 800mm FL. On the latter, the extra weight makes it even more uncomfortable.